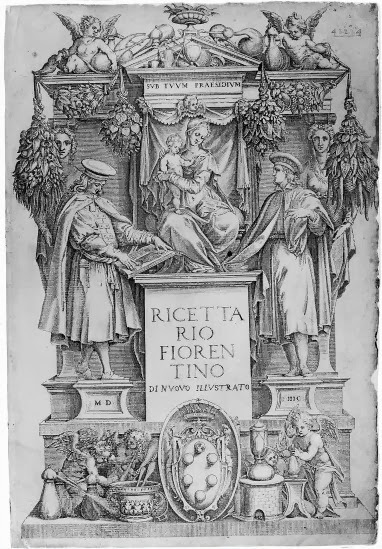 Frontispiece from Ricettario Fiorentino 1597 ed. In 1580, when Antonio Neri was four years old, just after the birth of his brother Vincenzio, both his father and grandfather were together granted full Florentine citizenship by Grand Duke Francesco I de' Medici. In Tuscany, citizen status was an honor conferred to a small fraction of the population and often through inheritance at around the age of thirty. The fact that Neri Neri gained citizenship at the age of forty and did so together with his father, Jacopo, shows it was not legacy, but perhaps their medical prowess that lead to the award. Antonio's father was a celebrated physician, and his grandfather was a well regarded barber surgeon. 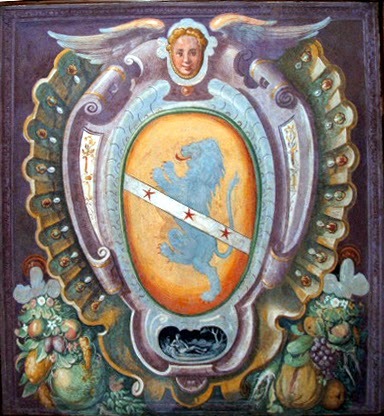 This period also corresponds to the first appearance of the unique coat of arms that distinguish this branch of the family. The same arms adorn the central panel of the vestibule ceiling at the Neri's residence. Citizen status bestowed the advantage of direct representation in the government and the right to hold public office. It also carried responsibilities to the city, to its leaders and to the Church. One requirement of citizenship was possession of a domicile within Florence. The baptism register listed Antonio and all of his siblings as residents of San Pier Maggiore parish long before the citizenship grant. However, it is in the 1580s that we see the first reference to Neri Neri's ownership of the palazzo at what is now 27 Borgo Pinti. Within a few years, Antonio's father's work on cures for paralysis were published. By the end of the decade he was appointed personal physician to the new grand duke, Ferdinando de' Medici, and to the royal family. The 1590's saw Antonio taking vows, and beginning his career in the Church. The road to priesthood ran on a parallel track to an apprenticeship in a trade. The completion of a trial period led to becoming a novice at the age of sixteen, then deacon and finally priest at around twenty-two. Meanwhile, Antonio's father, along with another doctor and two apothecaries was chosen by the entire Florentine College of Physicians to revise and update the famed Ricettario Fiorentino. This book was the gold standard of doctors and pharmacists in Tuscany and throughout much of Europe. The Ricettario was an official reference for medicinal cures and prescriptions. The law required every apothecary to own a copy and to supply its listed formulas to customers. Many regard this volume as the first European pharmacopoeia. It was a systematic standardization of drug recipes and dosages. Throughout the Medici reign, updated editions appeared as knowledge progressed. The book is a major landmark in the history of medicine. The edition authored by Neri's father and colleagues, in 1597, proved so popular that in 1621 it was reissued without change. There can be no doubt that Antonio's father and his work had a profound influence on the priest. 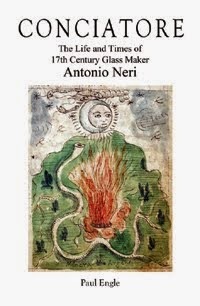 In the introduction to his book on glassmaking, L'Arte Vetraria, he proclaims his desire to publish his own work on chemical and medical [spagyric] arts, saying "I believe there is no greater thing in nature in the service of humanity." In his recipes he uses the terminology of physicians; adding chemicals in 'doses' and measuring 'ana' (in equal parts). In a 1608 letter to a friend,  Antonio describes his great success with medicinal cures of Paracelsus, "to the great wonderment of Antwerp." The priest also references experiments he carried out in Brussels and at the Hospital of Malines. Following in the footsteps of his father and grandfather, medicine would continue to be practiced in the Neri family for generations to come. This post was first published here in a slightly different form on 16 October 2013.